Traumatic dental injuries often occur in accidents or sports-related injuries. Chipped teeth account for the majority of all dental injuries. Dislodged or knocked-out teeth are examples of less frequent, but more severe injuries. Treatment depends on the type, location and severity of each injury. Any dental injury, even if apparently mild, requires examination by a dentist or an endodontist immediately. Sometimes, neighboring teeth suffer an additional, unnoticed injury that will only be detected by a thorough dental exam. Endodontists are dentists who specialize in treating traumatic dental injuries. With their advanced skills, techniques and technologies they can often save injured teeth. If you have a cracked or injured tooth, find an endodontist near you right away! Most endodontists offer tremendous flexibility in accommodating emergency cases including weekends in some cases so your pain can be relieved quickly. Most chipped or fractured tooth crowns can be repaired either by reattaching the broken piece or by placing a tooth-colored filling. If a significant portion of the tooth crown is broken off, an artificial crown or “cap” may be needed to restore the tooth. If the pulp is exposed or damaged after a crown fracture, root canal treatment may be needed. These injuries require special attention. If breathing through your mouth or drinking cold fluids is painful, bite on clean, moist gauze or cloth to help relieve symptoms until reaching your dentist’s office. Never use topical oral pain medications (such as Anbesol®) or ointments, or place aspirin on the affected areas to eliminate pain symptoms. Injuries in the back teeth often include fractured cusps, cracked teeth and the more serious split tooth. If cracks extend into the root, root canal treatment and a full coverage crown may be needed to restore function to the tooth. Split teeth may require extraction. During an injury, a tooth may be pushed sideways, out of or into its socket. Your endodontist or general dentist will reposition and stabilize your tooth. Root canal treatment is usually needed for permanent teeth that have been dislodged and should be started a few days following the injury. Medication such as calcium hydroxide may be put inside the tooth as part of the root canal treatment. 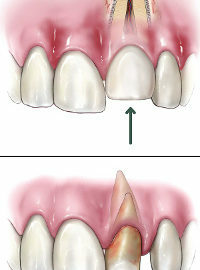 A permanent root canal filling will be placed at a later date. Children between seven and 12 years old may not need root canal treatment since their teeth are still developing. For those patients, an endodontist or dentist will monitor the healing carefully and intervene immediately if any unfavorable changes appear. Therefore, multiple follow-up appointments are likely to be needed. New research indicates that stem cells present in the pulps of young people can be stimulated to complete root growth and heal the pulp following injuries or infection.